Based on images painted on jars of the same date, the female figure with upraised arms appears to be celebrating a ritual. 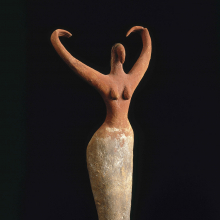 The bird-like face probably represents her nose, the source of the breath of life. The dark patch on her head represents hair, also a human trait. Her white skirt indicates a high-status individual. Occasionally an innovative artist enhanced a traditional sculptural form. 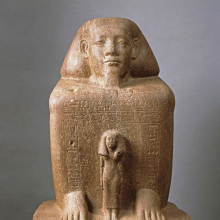 This statue of Senenmut—an important official during the joint reign of Queen Hatshepsut and King Thutmose III—appears in the classic kneeling pose known since the Fourth Dynasty (circa 2625–2500 B.C.E.). 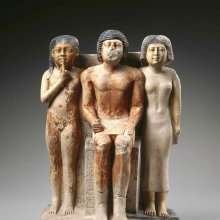 Old and Middle Kingdom kneeling statues show a subject with his hands resting on his thighs or holding a pair of tiny round vessels. 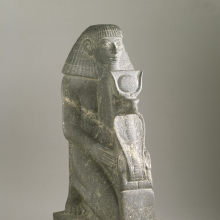 The sculptor of this piece, however, depicted Senenmut presenting a complex object: a cobra resting in a pair of upraised arms, wearing cow horns with a sun-disk. Egyptologists interpret this image as a cryptogram of Hatshepsut’s throne name (Ma`at-ka-re). 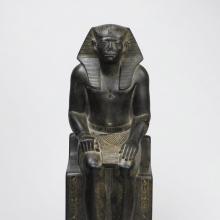 The sculptural form of a kneeling man holding an intricate symbolic image first appeared in statues of Senenmut and continued for hundreds of years. Perhaps this new type of statue was the product of Senenmut’s imagination, as interpreted by a skilled and receptive artist. 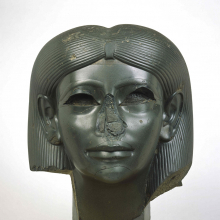 The rich, dark patina of this head is not ancient; the original surface has a duller tone. Whether the head represents an individual is a matter of dispute. It may depict a particular but now unknown priest or government official, or it may be a stylization. 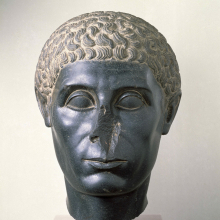 The curly locks reflect Hellenistic influence, an important component of Egyptian art of the ptolemaic Period, but the formulaic execution is Egyptian. One scholarly opinion holds that the face consists of many nonintegrated features drawn from disparate sources and cannot therefore be individualizing. According to this theory, the front and side views do not merge and the forehead is a schematic, unrealistic trapezoidal configuration. Likewise the facial planes are allegedly too sharply demarcated and the heavily lidded eyes are oversized hieroglyphs. The accuracy of these claims is open to question. The decoration of Nespanetjerenpare's cartonnage richly details the theme of resurrection and permanence. Above the wesekh-collar is a protective pectoral in the form of a djed-pillar and a tyet-amulet. The djed-pillar is the hieroglyphic writing of the word “stability” or “endurance,” and the sign tyet, often written in assocation with djed, expresses the idea of well-being. Below the wesekh-collar is a ram-headed falcon pendant, a representation of the solar god as he travels through the underworld at night. Ihe cartonnage base is decorated with ankh-signs and was-scepters, the hieroglyphs for “life” and “power.” The small registers in the front depict a variety of deities associated with the parts of the body—like the eyes, lips, and teeth—deities who serve to protect the owner and keep his mummy bound together for eternity. 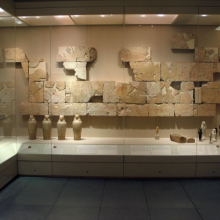 One of the world's best-known works of Amarna art, the Wilbour Plaque is named for the American Egyptologist Charles Edwin Wilbour (1833–1896), who purchased it in 1881. The plaque was never part of a larger scene. Originally, it was suspended on a wall by a cord inserted through the hole at the top. 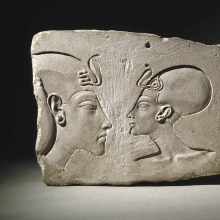 Artists used it as a model for carving official images of an Amarna king and queen. The queen shown here is certainly Nefertiti; the king may be Akhenaten, hi co-regent Smenkhkare, or young Tutankhaten (later Tutankhamun). 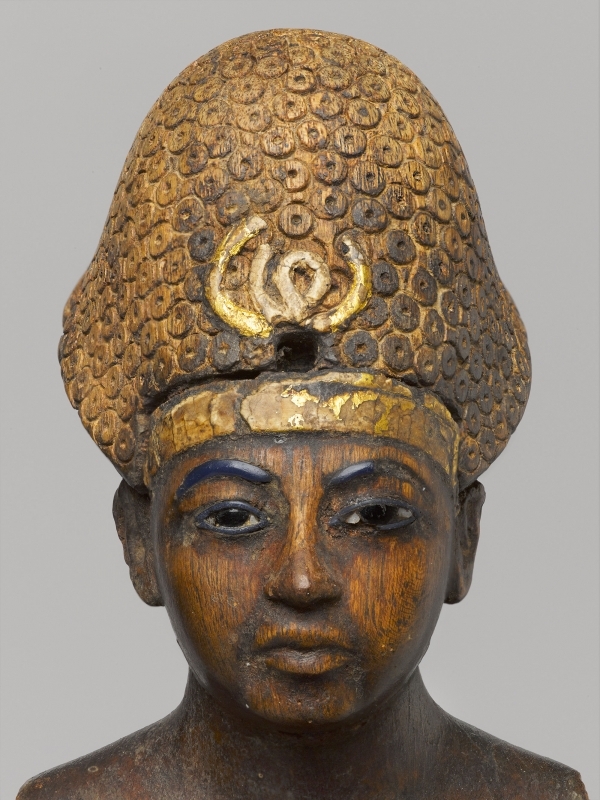 A masterpiece of Middle Kingdom royal sculpture, this statue of the Twelfth Dynasty king Senwosret III encapsulates one basic theme of this installation: the interaction between permanence and change. 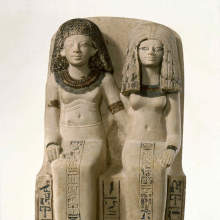 By the time an artist carved this piece, the seated pose had been part of Egyptian tradition for more than eight hundred years; most of the elements of the costume had been around even longer. 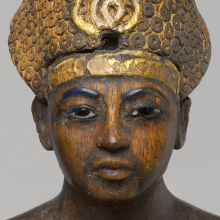 However, the style of carving—note Senwosret’s expressive face—had been in vogue for less than a generation. Sakhmet, whose name means “The Powerful One,” wears a sun-disk and cobra on her brow, identifying her as the daughter of the sun-god Re. 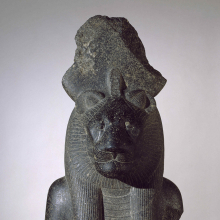 In her role as the Eye of Re, Sakhmet was dispatched abroad to destroy Egypt’s enemies. Angered because Re set another goddess in her place while she was away, the Eye refused to return and protect Egypt, until pacified by wine, music, and dance. The Egyptians explained the sun’s annual motion toward the south and then back to Egypt as the Eye’s departure and return. In other myths, Re’s Eye symbolized natural phenomena, such as the Nile’s annual flood and the Egyptian new year. Magical decoration ensuring the deceased’s wishes was at first put on tomb walls, but in Dynasty 21, the most elaborate decoration began to appear primarily on coffins. 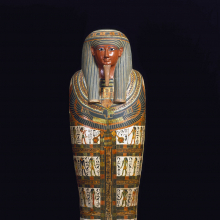 The lid of this coffin shows Osiris, the god of the dead, depicted multiple times; Nut, the sky goddess; and, on the interior, the goddess of the afterlife—three deities who together create a miniature universe for the mummy to inhabit. 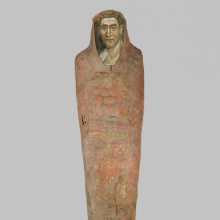 The outsides of the box depict the deceased’s journey to the afterlife, including the final judgment by weighing his heart against the feather of truth, while the mummy board shows him as a living presence arrived in the next world. Carbon-14 dating conducted in 2009 indicates that Pasebakhaienipet, who was the mayor of Thebes, died between 1110 and 939 B.C.E., a date supported by the Twenty-first Dynasty style of his coffin. 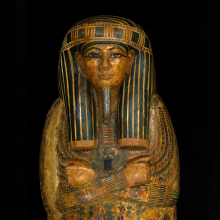 His elaborate coffin and mummification in the most expensive style suggest his high status in Egyptian society. This is one of the most important religious texts of the New Kingdom, in part because it is an early version of the Book of the Dead, revealing the development of all later ones. 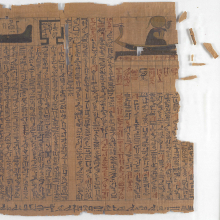 The papyrus is about twenty-five feet long, inscribed on both sides (a rare feature), and contains nearly one hundred “chapters,” almost half of the total known group of Book of the Dead texts. Several of the chapters are closer to those found in the Coffin Texts, the collection of funeral texts used in the previous period. Mummy of an Anonymous Man was unwrapped in the 1950s, when it was the subject of a TV show, and rewrapped in 2010 for this exhibition. Carbon-14 dating conducted in 2009 suggests that this man died between 259 and 398 C.E., confirming the third-century date suggested by the style of the cartonnage. Egypt was a truly multicultural society. 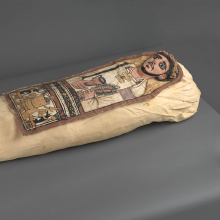 Although mummifying the dead was an Egyptian tradition, the name Demetrios inscribed on the mummy's linen wrapping indicates that this man was Greek. The red pigment on his linen shroud was made with lead imported from Spain. His portrait, painted on a wooden panel in the medium of encaustic (wax with pigment), is Roman in style. The gold leaf decoration on the linen includes Egyptian divinities and Demetrios's name and his age at death, fifty-nine, written in Greek. 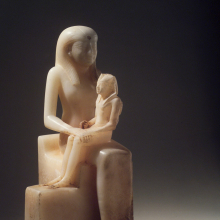 Our collection of ancient Egyptian art, one of the largest and finest in the United States, is renowned throughout the world. The galleries for this unparalleled collection have been reorganized and reinstalled. The ancient Egyptians were an indigenous African people who first appeared in the southern (Upper Egypt) Nile Valley by 4500 B.C.E. and spread northward to Lower Egypt. 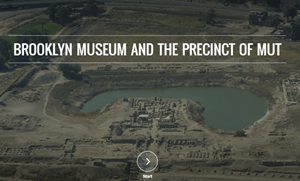 Joined over five thousand years by other Africans from Nubia and Libya, as well as Semites, Persians, Greeks, and Romans, their distinctly multicultural society produced an astonishing array of objects and structures. 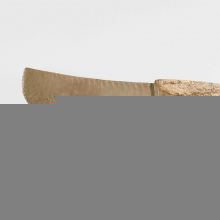 Egypt is the oldest continuously documented civilization on the African continent, and our collection, begun in 1902, tells the story of its art from its earliest known origins until the Roman period. 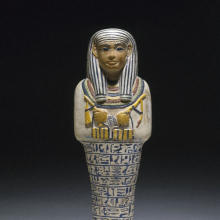 Our Egyptian galleries contain more than 1,200 objects that include sculpture, relief, paintings, pottery, and papyri. On view are such treasures as a wooden and gilded statuette of Amunhotep III, an exquisite chlorite head of a Middle Kingdom princess, an early stone deity from 2650 B.C.E., a relief from the tomb of a man named Akhty-hotep, and a highly abstract female terracotta statuette created over five thousand years ago. The Mummy Chamber is a special section that explores the rituals related to mummification and the Egyptian belief that the body must be preserved to ensure eternal life. On view are the elaborately decorated coffin and mummy board of the mayor of Thebes, Pasebakhaienipet; wall reliefs from the tomb of the vizier Nespeqashuty; several mummies; and a nearly twenty-five-foot-long Book of the Dead scroll. This installation is organized by Edward Bleiberg, Curator of Egyptian Art, with Yekaterina Barbash, Associate Curator of Egyptian Art.